James Bond - The Secret Agent: New James Bond auction with 108 lots coming your way! New James Bond auction with 108 lots coming your way! On Tuesday march 15 an new James Bond auction will be heading our way. Once again it is Vectis Auctions Ltd in the UK that will have a specialist sale featuring 108 lots of James Bond merchandise. As a James Bond book collector sadly there will not be anything for me to bid on but I believe my wallet (and wife) is happier about this more then I am. The stuff fore sale this time around looks very familiar to the last James Bond auction that Vectis had. Can it be that collectibles did not sale the last time around or is it just allot of James Bond stuff out there that all looks the same. 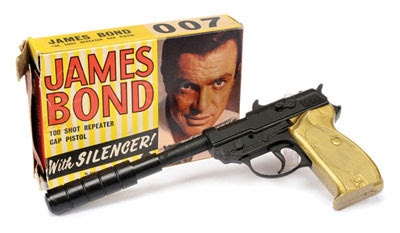 You can see all of the 108 lots of James Bond memorabilia at this link. Please use the comment section below to comment if your see something you would wish to own. Would love to hear about it.